Andy Willett, left, walks his English springer spaniels Ruby, 6, left, and Twiggy, 1, on Monday in Madison's Regent neighborhood. It includes the 53726 ZIP code, which has the lowest prevalence of obesity in Wisconsin, according to a new map. Willett encountered Mary Lou Krase, with her dog, Brody, a 1-year-old red heeler. 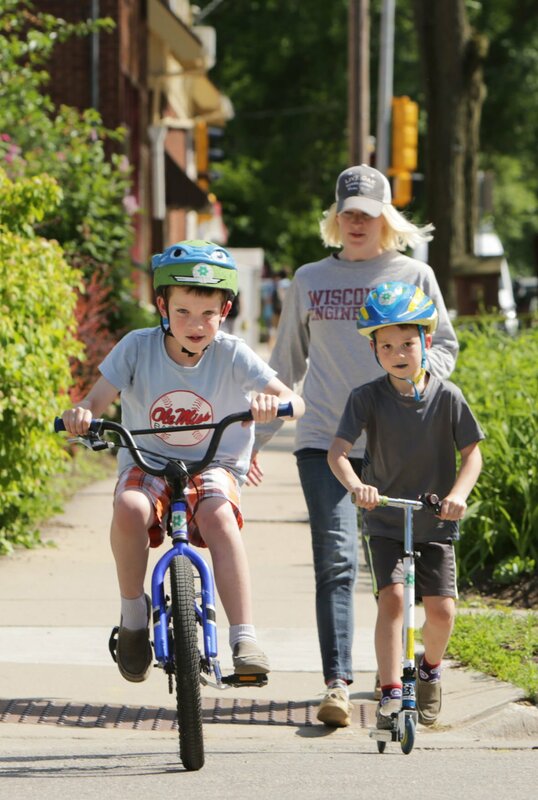 Dominique Bechle follows her children, Oscar, 7, left, and Oliver, 5, on Monday after a trip to the Regent Market Co-op in the Regent neighborhood in Madison. The neighborhood's 53726 ZIP code has the lowest levels of obesity for adults and children in Wisconsin, according to a new map. Obesity rates in Wisconsin vary four-fold among adults and six-fold among children, with rural residents most likely to carry excess weight, according to the first obesity map in the state broken down by ZIP code. UW-Madison’s Wisconsin Obesity Prevention Initiative found that overall, 41.2 percent of adults and 14.8 percent of children were obese in 2015-16. The adult rate ranged from 15.9 percent on Madison’s Near West Side to 67.2 percent in St. Nazianz, in eastern Wisconsin. The rate for children ranged from 5.8 percent in the same Madison neighborhood, near UW-Madison, to 38.5 percent around Tigerton, between Wausau and Green Bay. “Where we live has a tremendous impact on our risk for developing obesity,” said Dr. Vincent Cryns, a UW Health endocrinologist and leader of the Obesity Prevention Initiative. Previous maps looked at obesity by county or the state as a whole. The Obesity Prevention Initiative is encouraging communities to develop physical-activity and healthy-eating programs tailored to their populations. With obesity rates available by ZIP code, “communities that are working on obesity prevention can use this information to help figure out how to guide their efforts,” said Hilary Joyner, a UW-Madison researcher who directed the map project. Rural areas generally had higher obesity rates than urban or suburban ones. That could reflect less access to health care and affordable, healthy foods in rural places, a greater dependency on driving or other factors, Joyner said. The map for children closely resembles the one for adults, suggesting environment plays a significant role in obesity, said Sara Lindberg, a UW-Madison researcher who worked on the project. Researchers compiled the map using anonymous electronic medical record data from 13 health care systems through the Madison-based Wisconsin Collaborative for Healthcare Quality. The obesity rates are based on heights and weights measured at doctor visits from mid-2015 to mid-2016. According to the measurements, 41.2 percent of adults had a body mass index of 30 or more, meaning they were obese. A separate health survey that uses self-reported heights and weights found 30.7 percent of Wisconsin adults were obese in 2016. The measured statistics are considered to be more accurate, Cryns said. In self-reported surveys, “it’s easy to not remember exactly how tall you are or how much you weigh, or to round the height numbers up and the weight numbers down,” he said. Data from 1.8 million Wisconsin residents, about a third of the state’s population, are included in the new map. Some parts of the map are blank because there weren’t enough data from those areas. Future maps will incorporate more data, the researchers said. The researchers didn’t rank the ZIP codes, saying there’s room to lower obesity rates everywhere. Some urban neighborhoods had high rates, including some next to those with low rates, they noted. The ZIP code with the lowest obesity rate for adults and children was 53726 — in Madison’s Regent Neighborhood, east, north and south of West High School. The highest rate for adults was 54232, in St. Nazianz, southwest of Manitowoc. For children, the highest rate was 54486, centered around Tigerton. Both towns have fewer than 1,000 people. The Wisconsin Obesity Prevention Initiative, which started in 2015, is funded by $9.7 million over five years from the UW School of Medicine and Public Health’s Wisconsin Partnership Program. Some efforts have focused on Marathon and Menominee counties, with wayfinding signs increasing walkability in Wausau and feasts promoting traditional foods of the Menominee tribe.